i've been thinking about this topic again... cause it is really bothering me. gmail clipping messages, at first i thought this was based on the tags that we as marketers use - some email coders are just pulled from the web-dev team in our organizations, so they use common tags like '<class="header">' and '<class="footer">'. this we've been told for a while is a no-no, and actually one i agree with, gmail and other web-based email clients strip out the header and footers of our messages to avoid any display issues with their own headers and footers and that makes sense. message clipping could have bigger implications for us as marketers, as i discussed here. if you view your messages in the gmail app on android, there is no way to display the clipped portion of your email, but this isn't true on the web-based gmail interface. this has been a known bug in the gmail system since at least 2012 - did anyone else miss that memo, i did - and i use the gmail app on my htc one. here is an example of an email viewed on my mobile device, i'm only loading the lowest portion of the communication. 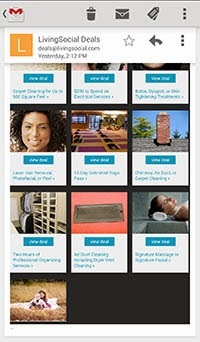 it is obviously from livingsocial, a daily send that can get quite long if there are a lot of deals. in the gmail app, you'll see only an ellipse (...) at the bottom of the email indicating that there is more content. okay, great - how do i get to the rest of the message. the quick answer is, you can't...the long answer, go to your web-browser and view it there - either on a pc or within your phone. here is the bottom portion of the same email, but in the chrome browser - after i clicked on "message clipped" statement. big difference huh? there are an additional fourteen (14) deals that aren't shown in the mobile version, (one has to wonder if those deals are sold at a lower price, because the number of impressions that they are receiving has to be less...but that's a different discussion...). but back to the message caching, if gmail is now caching the images, aren't they effectively altering the code and the size of our email communications? without having to display all of these images, the file should be considerably lighter, especially if you're one of those senders who attaches the images instead of calling them from the servers. i can understand google doing this, it makes sense to clip the message, but by doing this, they are doing harm to email marketers. we all know that people either knowingly or unknowingly make spam-traps - email addresses they send the communications they don't ever want to see and we all know that subscribers are more inclined to delete messages instead of unsubscribing or worse yet, they continue to get the messages but never open them. this has an impact on sender reputation. subscribers getting your messages, in an account that they used to actually open in and aren't now because of message clipping, have made a defacto spamtrap, without a visible link to unsub from your messages, when they do open them, are going to simply delete them. these two habits are going to have an impact on the (mythical) engagement scores that isp's use to make sure that we as marketers behave. that impacts our sender scores and ip reputations, which then has an impact on overall deliverability. but probably the most unique impact this message clipping could have is can-spam violations. could a mobile only reader - meaning that they don't own a computer or have access to one - eventually make a case for violations and shut your program down? who is blame for this "violation"? is it you the marketer for making a message over 102kb or is it gmail for imposing this restriction without really clearly communicating it to the industry? arguments can be made to support both - as a marketing professional i should "know better" that this is just one of those rules of the game - any message over xyz kb is going to be clipped, i need to keep my message under that - or that google in the interest of delivering a much more mobile friendly experience (this includes google glass) is violating the can-spam rules by removing what we are including to be compliant. so my advice is to play by the rules that gmail is setting. keep your messages under 102kb to avoid it being clipped, and work to optimize your messages to be viewed on mobile devices - and eventually with only one eye...after all it's google world and we're just allowed to view it.